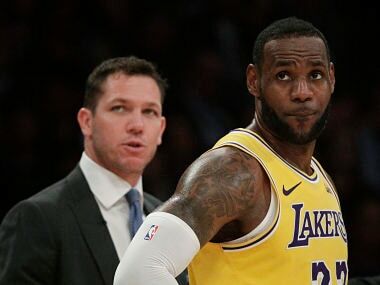 Oakland: The Los Angeles Lakers lost LeBron James in the third quarter to a strained left groin then went out and beat the two-time defending champions without him on Tuesday, getting King James' 17 points, 13 rebounds and five assists before the injury in a surprising 127-101 rout of the Golden State Warriors. Stephen Curry made consecutive 3s shortly after James exited and the Warriors got within 78-76 at the 2:48 mark of the third — but Kyle Kuzma and the persistent Lakers stayed at it every possession. Curry wound up with 15 points but the home fans had seen enough well before the final buzzer and headed out for the rest of Christmas. 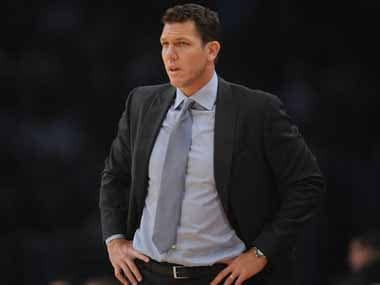 Kuzma contributed 19 points with a pretty baseline three late, Ivica Zubac had 18 points and 11 rebounds and Rajon Rondo 15 points and 10 assists off the bench as the Lakers snapped an 11-game losing streak on the Warriors' home floor since a 118-115 overtime win on 22 December 2012. 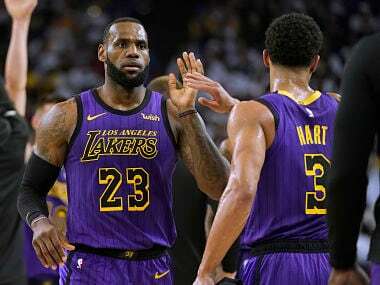 Los Angeles also ended a seven-game skid overall in the rivalry with their first win in the series since 6 March 2016. James made it look easy early on shooting over Jonas Jerebko and Kevon Looney. James hit a turnaround jumper at the 4:39 mark of the second quarter to put the Lakers ahead 52-37 and LA led 65-50 at the break. Lakers coach Luke Walton — a former Warriors top assistant and dear friend of Steve Kerr — got some time with his Hall of Fame dad, Bill, before the game and a few moments to catch up with Curry and share holiday greetings in the hallway after the two-time MVP's warmup routine. Lakers center JaVale McGee was still sick with a respiratory infection and missed his fifth straight game, didn't travel and missed his scheduled moment to receive his championship ring. That will now happen 2 February when the Lakers return to Oracle Arena.